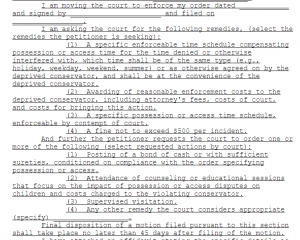 Texas Representative James White has filed another powerful bill in the Texas Legislature this 85th session, HB 3883, relating to interference with possession or access to a child, with penalties. The Bill that was filed today is an attempt to fix this. The bill filed kept almost everything that Sherry Palmer with Fix Family Courts wrote into the proposed bill. Sherry took the information that Mike had provided her regarding his research on why police and district attorneys were not enforcing. Sherry also spoke with some investigators and attorneys herself to find out what language was creating the reluctance to enforce the criminal laws against violating parents. Her goal with the language in this bill was to eliminate some of the reasons that some parents were not able to get their orders enforced. This bill changes the procedure for how parents get their custody orders enforced. It adds a simplified, less expensive, and sped up process to enforcement. This bill makes it clear that the criminal code applies to parents violating custody, not just parents failing to pay child support. 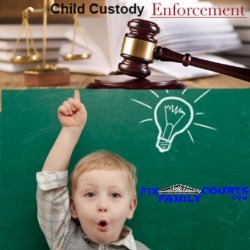 In the past, the only enforcement has been against parents behind in child support. We hope that this bill will change that. You can register to follow this bill and others here. And register to testify on the bill here. The form in this bill was copied from the Oklahoma bill that went into effect on November 1, 2014. “Law-abiding noncustodial parents will no longer have to deal with having their visitation rights ignored or violated thanks to legislation signed into law Tuesday. Senate Bill 1612, by Sen. Ron Sharp and Rep. Jon Echols, will ensure that custodial parents honor court-ordered visitation schedules for noncustodial parents or face punishment.” We hope that on September 1, 2017 that the same will happen for Texas parents. PreviousDoes ChanceTheRapper Know The Fight He Has Ahead of Him in Family Court?